2018 Crestliner 1870 FCC with a Mercury 80HP 4-Stroke Jet. The price listed includes: boat, motor, trailer, rigging, and freight. Get $500 off the sale price with Crestliner’s Military Rebate Program. Proper documentation required. 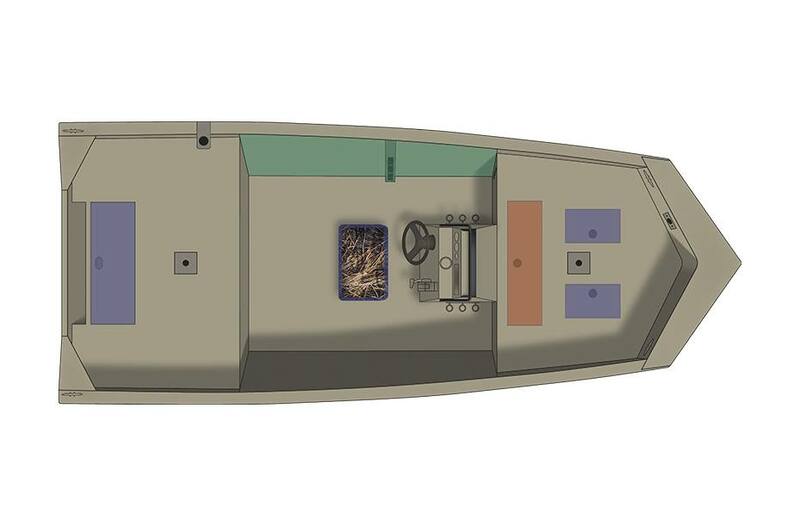 One of the newest additions to the Retriever series, the 1870 Retriever FCC is an 18-foot forward center console boat built to give you a maximum line of sight and features a jet engine tunnel hull so you maneuver shallow waters and go where other boats can't. Not only is the 1870 capable of reaching the shallowest sweet spots, but the all-welded construction of the forward center console aluminum boat is durable enough to withstand even the rockiest shorelines. Similar to the other models in the Retriever family, these boats are built with purpose. The 1870 comes standard with a 17-gallon livewell, ample storage, and room for up to seven fishing or hunting buddies. When you want to see what's ahead, you'll want the 1860 Retriever FCC under foot. Aluminum Forward Center Console: The aluminum forward center console provides added visibility to what lies ahead and features toggle switches and space for electronics. Bow Deck with 17 Gallon Livewell & Storage: Bow features spacious dual compartments storage to keep gear secure, stowed away and dry. A standard 17-gallon livewell is also located in the bow for easy access. Lock Track Gunnel System: Our exclusive Lock Track gunnel system allows accessories to be quickly mounted, adjusted and removed, ensuring you're always properly outfitted. Quick Access Portside Rod Rack Accommodates Three Rods: Portside rod rack holds up to three rods. Seat Box with Cushion & Storage Below: Sit comfortably, or stand in front of, the seat box while you maneuver the shallow waters. Seat box includes storage below. Jet Engine Tunnel Hull: The optional Jet Engine Tunnel Hull allows you to take your boat to just about anywhere on the water. Stern Deck Seat Cushion: Stern deck cushions provide comfort for your crew while navigating. Leaning Post with Cushion and Folding Foot Rest: Patience is the key to pursuit, and you can do that comfortably with this padded leaning post and fold down foot rest. New! Tempress Seat: New, no frills fold-down seat that provides just the right amount of comfort. Lock Track Bracket: Our exclusive Lock Track gunnel system allows accessories to be quickly mounted, adjusted and removed, ensuring you're always properly outfitted. Crest-Liner Interior Coating: Crest-Liner non-slip, durable and easy to clean, with Crest-Liner interior coating you can focus on the catch. Camouflage paint optional. Weight (Boat only, dry): 970 lb. Max Weight Capacity: 1,578 lb. Aluminum Gauge Sides: 0.100 in. Aluminum Gauge Transom: 0.100 in.